Remember back in the day when you would call up your friends to come to play some games. It didn’t matter whether it was board games, videogames, sports, or whatever…the main reason for doing it was to have a good time with your friends. This week’s guild got its start practically the same way. A group of friends deciding they wanted to have a good time enjoying adventures in the Star Wars universe. Honestly, when it comes down to what we value in our life, whether its family, friends, entertainment, etc. it is because we have some level of fun or enjoyment in the activity and the company of the people with us…if not why do it? How did your guild, the Omega Knights come to be? Why did you all choose Star Wars: The Old Republic? The Omega Knights were founded by 4 friends that decided we wanted to all play games together. We were all spread out around various MMO’s but we all shared one common interest in the Star Wars IP. Obviously we felt that Bioware would do an amazing job on the game and that it would allow us to experience a great Star Wars experience. When we first started playing together it just started out as a text message to each other saying are you buying the game? I and one other Officer Swordfish had purchased the Collector’s Edition and were already in the Open Beta and Early Access. Most of your guild is composed of older gamers, how does this change or dictate the pace or gamestyle of your guild? I think that older gamers definitely dictate the pace of our game play. While some guilds are able to go gung ho for server first kills on new operation content or new world bosses, they are only able to do this by playing hour after hour, night after night to achieve these accomplishments. With older gamers, most of us are married, have children, demanding careers. We come to SWTOR to unwind and enjoy a good game together. This ultimately means that we will never be server firsts or world firsts or heck even completion all of the content before more is released. We try our hardest but not to the extent of sacrificing real life or alienating under geared or new members. What faction and server are associated with the Omega Knights? What led to the decision for this faction and this type of server? We are a Republic Guild on The Helm of Graush originally; we then transferred to Prophecy of the Five to further increase our numbers and have more people to play with every night. We ultimately chose a PvP server because while most of the Officers like to dabble in PvP, at the time we had one officer in particular that was really gung ho about it. 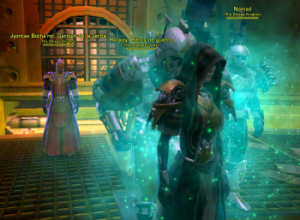 Speaking for myself I enjoy the World PvP aspects that the game used to offer and hope that BioWare will implement a World PvP system again soon. Your guild has one major rule above them all, what is it? Why is this rule so important for your guild and do you feel this is sometimes lost in today’s gaming environment? Our First and foremost rule is Respect. Respect other guild members and other players in the game. We personally feel that an MMO is only as good as the community and that extends down to the responsibility of the player in the community. If you are constantly being negative or trolling general chat you are only degrading the quality of the community for a new player or existing player base. We think that the current mentality of gamers today is that they are isolated and behind keyboards anonymously and therefor can say or do whatever they want. This would never happen in a face to face social interaction so why should it happen in a virtual environment. Gamers should be respectful, and have more sparkle dust in their lives! As it appears SWTOR is starting another live-event soon, how did the Omega Knights like the last one, the Rakghoul Plague? Do you think that the game should try to have more of these events? Some of our members were very gung-ho about the live event. At the time of the Rakghoul event I was actually out of the game a bit more because I was getting married the following week. So I came in too late and have a few DNA samples sitting in my bank since BioWare won’t confirm if I can ever use the again. Other members of our guild were meticulous about getting every reward and camping World Bosses and learning their respawn timers. In Fact Ixion, one of our officers informed me today that he is planning to dedicate his weekend to maximizing all his characters for the live event. He absolutely loves collectibles. When the egg’s for the Orokeet pet came out Ixion learned the respawn timers and camped toons at each one. He collected over 100 eggs this way and actually made a fortune on the GTN. We have also seen a serious uptick in the number of players online in the guild since the event went live. Overall I think you could say the live events in our guild are well received. We try to organize groups to help people with them and also make sure that we are killing a few Imps along the way. With Legacy perks involving the other faction, does the guild have a presence in that faction? Do you and the guild like that some perks require players to play the opposing side? We have created an Alt Guild over on the Sith side, but it honestly doesn’t get played much. The Alt Guild name is The Alpha Warriors since it’s the polar opposite of The Omega Knights. I honestly don’t know how I feel about some of the perks being on the opposite faction. It seems nice in theory, but with a guild to run our officers simply don’t have time to run Empire Toons and operation events 5 times per week. We are more focused on being good at one thing, having a successful casual guild on the Republic side. Of course, if HK-51 requires me to level an Empire toon into the 30’s or 40’s I know what I’ll be doing for a few weeks. How do you and the Omega Knights feel about the recent news about the upcoming Free-to-Play option coming to SWTOR this Fall? Do you think this is a good or bad move for the game? I think some of us are hopefully optimistic that BioWare will introduce a Free to Play model that isn’t Pay 2 Win. However we also understand the balance that is necessary to keep a player enticed to actually pay for things in game. It is a tricky balance and one that I understand completely because of my educational background. I actually have a degree in Video Game Design and I think this allows me to look at things in a different light then many players who don’t understand what goes into making a “AAA” game like SWTOR. If there is one or a couple elements in the game your guild could change, what would they be and why? At this point to me the gear curve is getting steeper and steeper. If you are not committed to PvE or PvP then you are quickly out geared by your guild or other players in PvP. I find that in my current real life I don’t have enough time for being good at both. So you end up having to choose which one is most enjoyable. This is always the case though for any gear driven MMO. We would love to see systems put in place that can help circumvent the gear curves in some way. Crafting systems that are actually useful to the guild is one example of this. They got better in 1.2 with Campaign/War Hero being able to be Reverse Engineered. This truly helps bring members up to speed faster. But it is far from perfect. The best you can hope for is having a Cybertech and Artifice in your Ops runs so that the Armorings, Mods, Enhancements can all be learned and distributed to lower geared members of the guild. This is still a very long and arduous process that doesn’t give the medium size guild a lot of wiggle room for fill ins on Hard Mode Ops nights in Denova. What has been one of Omega Knights’ greatest achievements in the game so far? Are there any goals the guild has planned for the future? I think our greatest achievement has to be that we adhere to a no man left behind policy. We could boast that our main 8 man ops group did NiM EV and achieved Infernal before stepping into Explosive Conflict. We could boast that we have downed 2 of the 4 bosses in Explosive Conflict Hard Mode only running ops 2 times per week for 2 hours at a time. But these are not our greatest achievements. Our greatest achievements have been putting systems in place that allow new members of our guild to join 2nd & 3rd Operation teams and that the system expands and we are now forming our 4th and 5th 8 man operation teams. We combine this with a formula to allow members that cannot commit to 4 hours per week of game play with a set group to still set foot into Operation content like Explosive Conflict and see the bosses while having a good time without pressure to perform. This is exemplified by our actions in not blaming anyone for wiping during progression nights. Our entire team is responsible for the kill or for the wipe. When we come into a situation where we are having trouble with a particular boss the leadership of the ops listens to the members of the ops and takes their ideas into consideration. We don’t believe there is one strategy that rules them all for completing an encounter and know how to adapt without being upset with others for making a mistake. Now I know Omega Knights have talked about how they focus on fun, being respectful and also the “leaving no man behind” mentality. They also do not shy away from challenges. This video shows them managing to take down one tough boss, even when all seems lost…maybe just maybe, their attitude comes full circle. It’s a great video, they use Johnny Cash for the video music…I guess it’s only appropriate since the one who downs the Foreman Crusher is Johnny Cache! Are the Omega Knights currently recruiting? If so are there specific types of classes or advance classes the guild needs? We have an open recruitment policy. We do not turn anyone away and cannot see a reason as to why a guild would. We understand everyone is different and ultimately then allow a recruit to feel out if our guild is a good fit for them. We are always in need of new members and would encourage any and all to join us. Our ops teams need healers and tanks always, as well as non-force using DPS classes. But we still love the Shadows, Sentinels, and Sages! How is the best way for recruits or gamers seeking more information to get in touch with the guild or officers in Omega Knights? Anyone can find us at our website. Our forums are open for all to read so you don’t have to be a member to see what is going on in the guild! We also have a tab you can select to fill out an application to the guild, or you can send me mail in game to Crionos, Atti, Swordfish, Nairas, or Ixion. Thanks to all the members in the Omega Knights guild, for letting us learn more about their organization. I want to also thank the officers and especially their guild leader, Crionos for all the help in making this article possible. Without the extra time these people put in, I would not be able to bring you these articles. That’s all for this week. If you would like the get your guild or server event highlighted here at Corellian Run Radio, drop me an email at jason@corellianrun.com. See you all next week on Community Checkpoint!